The Hillgate lies in the heart of Notting Hill. 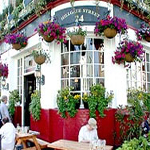 This is a beautiful, traditional English pub which sits proud on a plant and flower festooned corner site covered with luxuriant window boxes, hanging baskets and tubs. There are benches outside, sun-drenched in summer and accordingly very popular. Good value lunchtime food and a Sunday Roast served every day of the week, including Sunday. The Hillgate has a back bar that is available for private hire and can accommodate 35 for a buffet.